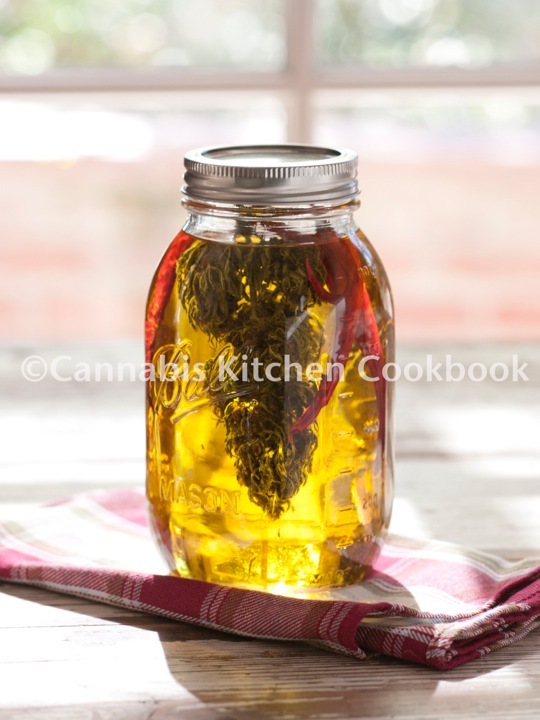 At harvest time, when cannabis is abundant, you can stuff jars with fan leaves, sugar leaves, and buds (sometimes spicing it up with fresh chilies, basil, cilantro, or oregano), cover the plant material with Organic Virgin Olive Oil, and let nature do its work. I like to infuse or ripen the oil in direct or sunlight for a couple weeks and then will store it in my kitchen cabinet. Throughout the year, long past harvest, I can pull out the oil to sauté eggplant, stir fry whatever the garden’s providing, or garnish stews. Sometimes, I have been known to eat a tiny spoonful, outside of any recipe, when in the mood for a straight shot of herbal yum. Oil made from fan leaves will have much less THC than oil made from sugar leaves, and oil made from flowers will be strong. With an abundance of whole plant at your fingertips and good storage space, you can create a line of oils ranging in potency to use throughout the year. Loosely pack cannabis in a clean pint jar, leaving about an inch of space at the top. Add enough oil to cover (still leaving an inch of space). Using a butter knife, gently press down on the herbs to eliminate any air pockets. Put cap on jar and a label that includes contents, date prepared, and approximate date oil will be ready (2 to 6 weeks from preparation date). Place jar on a small plate and set on a windowsill with what kind of light? Direct or diffused, both will work. After 2 weeks, taste oil. To make it stronger, let it continue to steep. From now until it’s at the level you want it to be, check it once a week. When oil is ready, line a fine mesh strainer with cheesecloth and place over a bowl, wide-mouth jar, or measuring cup. Twist herbs with cheesecloth, squeezing out every last drop of oil. Transfer oil to a clean clear or dark bottle or jar with a lid or cork. Label with the type of oil and date. Store in a cool dry place for up to a year.